Our goal at Jewelers3 is to put you at ease in knowing that you're buying the finest quality jewelry at the lowest possible price from the friendliest staff on earth! Our wholesale company gives Jewelers3 the buying capacity to purchase fine jewelry in quantities and at prices generally unavailable to most independent retailers. 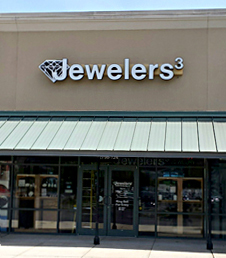 Shop us first, last, or in between and you will see for yourself that the prices, selection and service at Jewelers3 can't be beat. We feature a huge selection of designer style bridal and engagement jewelry to suit every budget and style need. Loose diamonds in all price ranges, sizes and qualities are available for your selection in our loose diamond search engine. You will find our service and prices second to none when shopping from our exclusive bridal jewelry selection. We are her to make one of the most important purchases of your lifetime a pleasurable, easy experience. Our in-house jeweler can repair and service almost any fine jewelry item. We offer free walk-in cleaning and inspection service of your fine jewelry. Custom design service and alterations of your existing fine jewelry are a specialty at Jewelers3.